On to the 2nd of today’s Finals in Norfolk the Ladies League Cup, FC Sprowston Ladies newly crowned Champion’s of Norfolk Women’s Division Two taking on Bungay Town Ladies who are looking to retain the League Cup having won it for the 1st time last season. The 2nd time a Sprowston side has featured in the Norfolk Women’s Finals day. FC Sprowston Ladies formed at the start of the season. The two sides are run as two different teams not a 1st & Reserves/Development. FC Sprowston Ladies building on a club that has a strong youth programme. Have dominated Norfolk Women’s Division Two this season with a 100% in both league and cup it looked as though they would go all the way to the League Cup Final with that record intact. But alas no they have been beaten once in the league this season by eventual runners-up Beccles Town Ladies who pushed them all the way. The league finished FC Sprowston Ladies are the Champions and come into the League Cup Final looking to do a double against a side that are thinking exactly the same thing! Whilst FC Sprowston Ladies are the Norfolk Women’s Division Two Champion’s, Bungay Town Ladies are on the verge of winning the Division One title having a 3 point lead over 2nd placed Sprowston Ladies. A win in their final league game at home to Gorleston FC Ladies this coming Thursday would almost certainly see them become champions. Sprowston having 2 games left can still equal their points tally Bungay Town Ladies however have the advantage of a larger goal difference. Are keen to successfully retain the League Cup this afternoon. A bye in the 1st Round of the League Cup for FC Sprowston Ladies. Bungay Town Ladies began the defence of the League Cup with a huge 10-0 win at home to Division Two side Freethorpe Ladies. 10-0 was the winning score for FC Sprowston Ladies as they cruised into the quarter finals beating fellow Division Two side Kirkley & Pakefield FC Ladies in the 2nd Round. Bungay Town Ladies were away to fellow Division one side Wymondham Town Ladies Reserves won the game 6-1 to reach the last 8. A much closer result for FC Sprowston Ladies in the quarter finals at home to fellow Division Two side Tavern Ladies the sides contesting a 7 goal thriller, FC Sprowston Ladies edging it 4-3. 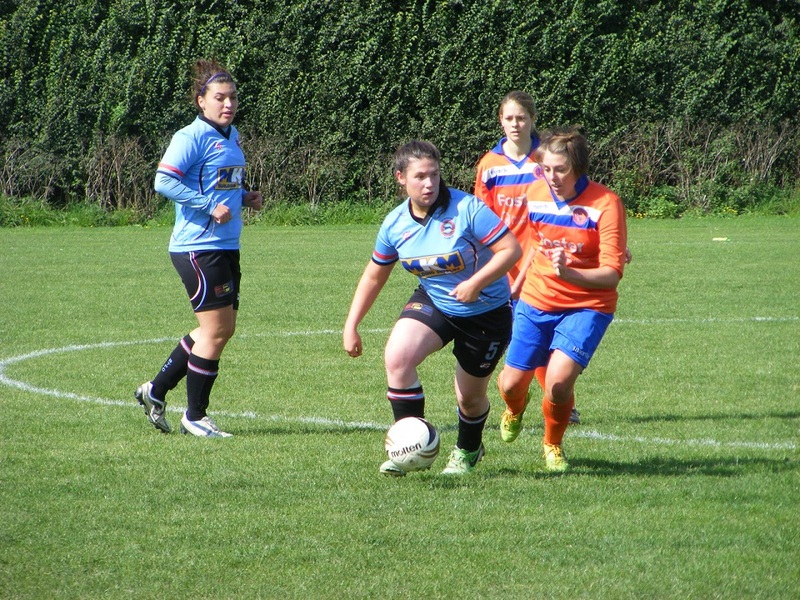 Bungay Town Ladies were at home to the young guns of Bure Valley Wildcats the Division Two newcomers on the wrong end of a 14-0 loss. Have since gone on to turn their season completely around with a strong finish. Into the last 4, FC Sprowston Ladies were away to Stalham Town Ladies. Another close game a narrow 2-1 victory seeing FC Sprowston into the final. For Bungay Town Ladies it was a repeat of last season’s League Cup Final away to Thorpe United Ladies. 2-1 to Bungay Town in that final, it was another close one with Bungay Town edging it 4-3 to reach a 2nd successive league cup final. If anything it’s hotter than the previous final the sun high in the sky. Retreated to the shady side of the ground to watch the game. FC Sprowston Ladies starting XI – Joanna Pipe, Megan Belsey, Annika Skoog, Lois Irving, Katie Fray, Rebecca Kirby, Nicole Read (C), Melissa Belsey, Georgia Potter, Jo Davey & Harriet Gregory. 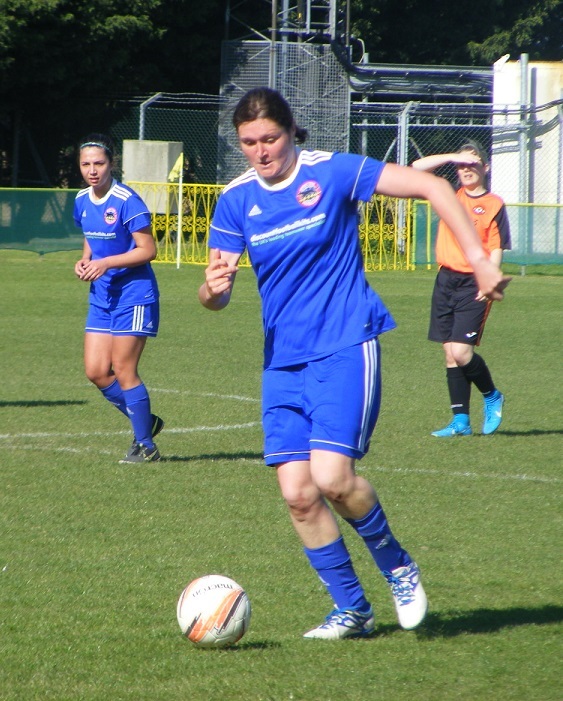 Subs – Rosie Wickenden, Laura Jenkins & Charmaine Storey. Bungay Town Ladies starting XI – Jody Wells, Kelly Collins (C), Ella Swift, Charlotte Power, Ella Hindley, Teo Ilie, Selina Rowland, Nicky Hazell, Lauren Purling, Emily Leach & Samantha Walker. Subs – Arianna Lloyd & Eva Evans. FC Sprowston to kick-off the league Cup Final wearing orange shirts with black shorts and socks with Bungay lined up opposite wearing an all Royal Blue kit. An early attack for FC Sprowston the ball played out to Harriet Gregory moving into the right channel a low shot drilled in on the angle, the ball spinning off Bungay goalkeeper Jody Wells getting down at her near post the corner conceded. The ball played in towards the near post Bungay get the ball clear. Centre back Katie Fray defends well up against Bungay attack Emily Leach as she has a run at the FC Sprowston defence after receiving the ball. Up the other end 3 Bungay defenders converge on Gregory as she makes a central run towards goal. Bungay press the attack Lauren Purling running up the right wing as Selina Rowland feeds her the ball whips a cross into the box, goes long the ball cleared by Megan Belsey for FC Sprowston. Purling is clipped as she tries to get away on the right, the free-kick awarded halfway inside the FC Sprowston half. Leach to play the ball into the box the ball knocked down into the mix is pushed out to Rowland top of the area, shifts the ball to her right and shoots the ball angling into the top right corner, Joanne Pipe in the FC Sprowston goal with an excellent save to get the ball away for the corner. Early in the game Bungay have the bulk of the attack, Samantha Walker running onto the ball through the middle strikes the ball from the top of the D her effort running narrowly wide of the post. Lois Irving steps forwards turning to charge down Walker’s next strike the ball spinning away for a throw on the right. Melissa Belsey tracking Purling into the right corner defend conceding the corner kick. Walker to take the inswinging ball towards the far post Purling getting her header on target FC Sprowston have defenders back on the post the ball won and cleared. Walker driving forwards into the box with the ball run wide to the byline right side cuts a cross/shot back in cut out by Pipe back to Walker sends the rebound back across the face of goal, Megan Belsey clearing at the far post. FC Sprowston are working hard at the back to deny Bungay the midfield pressing the ball, in attack Jo Davey pressures Charlotte Power at the back as she plays the ball back to the keeper. Gregory with a strike from distance put wide for FC Sprowston as she runs inside with the ball from the right. Walker looks to be in the clear into the area from the left side as she is given the ball following a throw-in. Irving with a great burst of pace gets back on the striker closing her down as she shoots the ball tame as it is safely collected by Pipe. 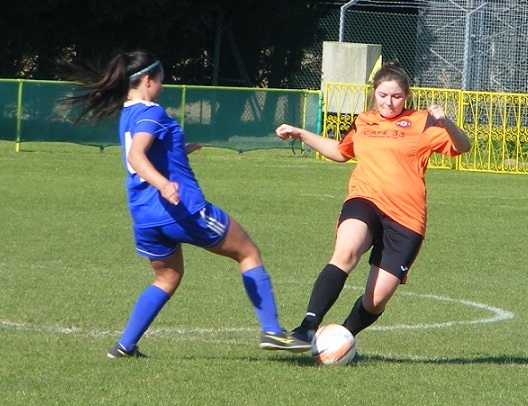 FC Sprowston captain Nicole Read winning the ball in the middle is fouled as she looks to carry it forwards. The set-piece dealt with by Ella Hindley at the back for Bungay. Purling is fouled on the right beside the box as she tries to bring the ball inside. Walker to fire the ball in across goal, FC Sprowston clearing the threat. Purling is busy on the right at the start of the match getting forwards her cross from the byline cut back to the top of the area Walker behind it takes the shot on the volley sends the ball up over the bar. Bungay continue to dominate the attack, FC Sprowston working hard to defend aren’t getting the ball into their own attackers 25 minutes played. Nicky Hazell puts the ball in over the top of the FC Sprowston defence, Leach running into the area, Pipe out to claim well as she is closed down. Melissa Belsey sliding in to deny Purling a cross as she surges up the right wing. Hazell bringing the ball on plays the pass inside from the left into Leach, Hazell bombs on into the area Leach sending her the return pass, Hazell putting it inside for Walker in the middle a clever flick to turn the ball goalwards, Pipe is well placed moving to grab hold of the ball. FC Sprowston attacks are few and far between getting forwards on the left win a free-kick on the byline a chance for players to come forwards, the ball played across the face of the goal dropping far post inviting no one can supply a final touch however as it runs wide. Fray with the interception to stop Leach getting through on goal as Teo Ilie and Rowland combine through the middle for Bungay. Bungay keep pressing forwards Walker picking the ball up top of the area, left side drills a shot in the keeper beaten, the ball striking the base of the far post the ball rebounding out across goal Annika Skoog 1st to it for FC Sprowston clearing for a corner with Walker looking to close her down. Skoog gets in front of Walker to get the ball back into Pipe as Rowland tries to play her in on goal. Into the last 5 minutes of the 1st half. Rebecca Kirby winning the ball for FC Sprowston in the middle plays it on for Georgia Potter on the right, Bungay captain Kelly Collins quick to close her down. Ella Swift getting forwards from right back for Bungay plays the ball forwards Rowland with the run, good defending from Fray as she closes the midfielder down. Goalless at the break, Bungay have had almost all of the attack and kept FC Sprowston penned in their own half for large portions of the game, have rode their luck a little chances going begging. For all that FC Sprowston as much as they are defending aren’t panicking, The defence coping with most intended through balls, Kirby and Read battling for the ball in midfield. A solid defensive base just can’t get anything going in attack. Bungay moving forwards well, Power and Hindley untroubled at centreback. Rowland and Ilie covering alot of ground. It’s Bungay to kick off the 2nd half. Are on the attack straight away Rowland bringing the ball on through the middle out to Purling on the wing heads the ball inside towards the area with Walker closing in, Irving getting her head on the ball first to clear for FC Sprowston. Read closes down Rowland as she lines up to shoot from 25 yards out. Skoog strong up against Walker as she tries to break through the FC Sprowston defence on her right. 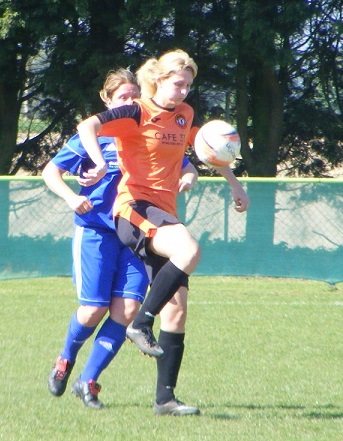 Megan Belsey stepping forwards from the FC Sprowston defence to challenge Hazell as she drives forwards from the left. FC Sprowston with a change Davey coming off, Laura Jenkins coming off in attack. The substitute getting hold of the ball straight away and having a run at the Bungay defence Hindley putting in the challenge to regain possession. Building through the middle Ille on for Rowland into Walker she turns and sets Leach up as she breaks in behind the FC Sprowston defence, shoots from 25 yards out her effort rising up over the crossbar. Despite the one sided nature of the game it is an intriguing contest FC Sprowston defending yes but doing so with confidence… and the longer they can keep Bungay out it’ll come down to whether they can create an opportunity up the other end. Hazell with a powerful run forwards on the left sends a diagonal ball into the area, Fray the 1st to it for FC Sprowston. Rowland getting forwards to support Hazell on the left wing nutmegs her marker the ball on for Hazell cutting inside unleashes a shot curling in on goal, Pipe getting behind it with a comfortable catch. Read charges down Ille as the midfield lines up a shot 20 yards out. FC Sprowston make a change Davey returning to the pitch Potter coming off. Megan Belsey with a double interception as Bungay try to play the ball through into the box from the left. Read with a great tackle inside the box to stop Leach getting a shot away as Walker squeezes the ball into her from the top left hand corner of the area. GOAL! At last the deadlock is broken, Bungay finding the back of the net at last to take the lead in the League Cup Final. Rowland getting the goal bringing the ball on looking for options ahead of her right of the goal 25 yards out isn’t closed down the opportunity presenting itself she doesn’t hesitate puts her foot through the ball plenty of power behind the shot it flies past Pipe before she can react and into the goal beyond 0-1. FC Sprowston work the ball from right to left off a throw in, Kirby getting forwards to support Jenkins the ball the ball helped across into Read, lays it forwards for Melissa Belsey breaking towards the box left side, Wells can come off her line to claim the ball. 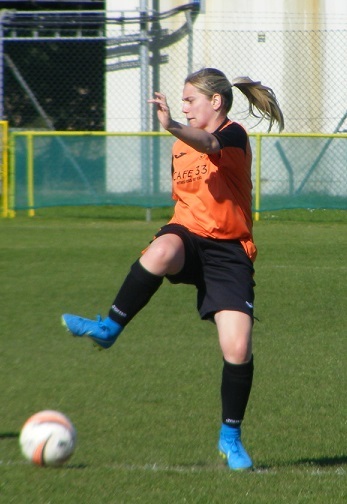 Potter returns to the action for FC Sprowston, Megan Belsey off. Bungay too make a switch Hazell coming off Arianna Lloyd coming on Purling moving over to the left wing. Read get’s the ball forwards support from Melissa Belsey, Ille getting in on her to win the tackle. Ilie with a great run forwards slides the ball on for Walker, doesn’t connect cleanly with her snap shot, the ball running harmlessly into Pipe. Fray conceding the corner for FC Sprowston as Purling cuts into the area from the left. The delivery into the top of the area Read half clearing for FC Sprowston, Hindley looks to latch onto the ball strike from distance her touch limited Pipe can come to gather the ball. Into the closing moments of the game FC Sprowston have a free-kick on halfway the ball up towards the area, Bungay comfortable in defence. The final whistle blows and Bungay Town ladies celebrate as they successfully defend the Norfolk Ladies League Cup. Bungay Town Ladies eventually getting the goal 2nd half enough in the end to see them win the final. Dominating the attack no doubt had a earlier shot found it’s way into the back of the net they may well have gone on to score more. As it was they didn’t as alot of credit goes to FC Sprowston for the work they did defensively where on the back foot for much of the game but confident in their work ethic and ability. Created very little attack wise largely content to stop Bungay at the other end. Easy to see why they are Division Two Champion’s a hard side to break down. Bungay have players all over the pitch who can create an opportunity in attack or set up another could have easily gotten frustrated as the chances went begging but kept at it the chance finally coming. It was an intriguing contest. Once again there were several contenders for the Women’s Football East – Player of the Match award. A tremendous effort from FC Sprowston Ladies to keep Bungay Town Ladies at bay, Katie Fray working tirelessly in the heart of their defence. Teo Ilie covering alot of ground in the middle of the park for Bungay Town Ladies as too did her midfield partner, and her goal nudges her into pole position so today’s Player of the Match is Selina Rowland. 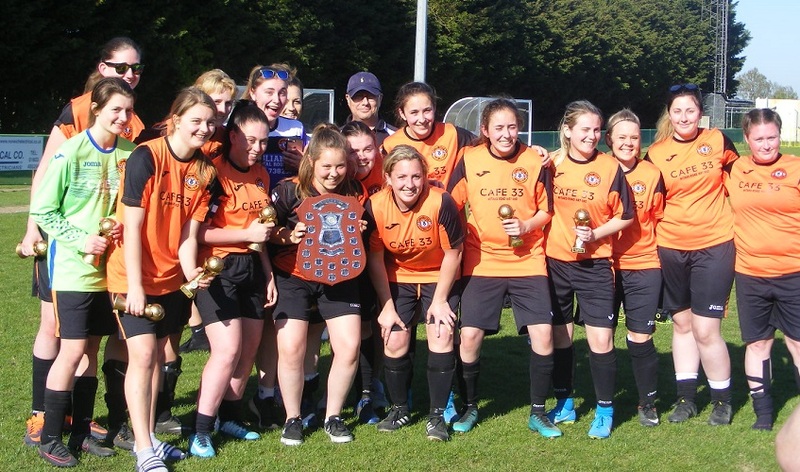 FC Sprowston Ladies made them work for the win and kept the score at 0-0 for so long, collected their league title award after the match, congratulation’s to them too on a fantastic season. 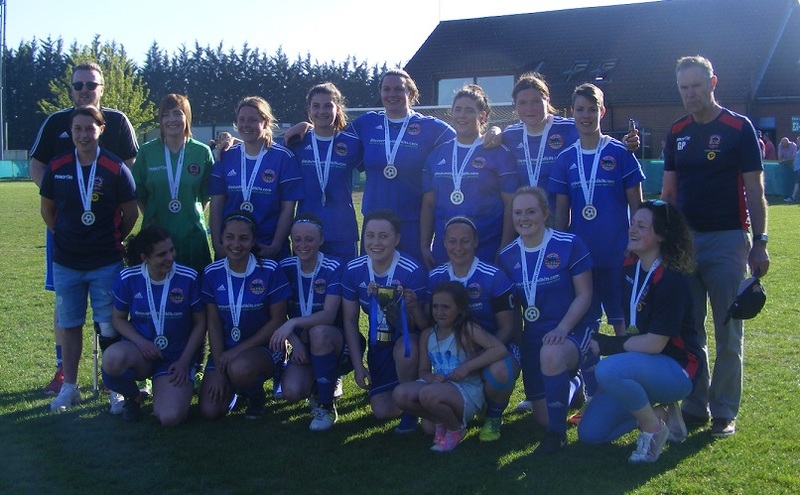 Costessey Sports Ladies were victorious in the Ladies 7’s Final beating Hellesdon Belles 5-2 to lift the trophy. A special mention to for today’s match officials, Lorraine Catchpole, Julia Robathan and Shaun Catchpole officiating in both of today’s 11 a side finals Shaun Catchpole also in the middle for the 7’s Final. A long but enjoyable day a cup final double sees me complete 8 games in the end in 11 days. Such as it is this time of the season. Not long left before the season finishes, another cup final double coming up next Sunday the ERWFL this time around. My thanks to both clubs for their help with the teams. To the NWGFL committee too for putting on a great occasion. 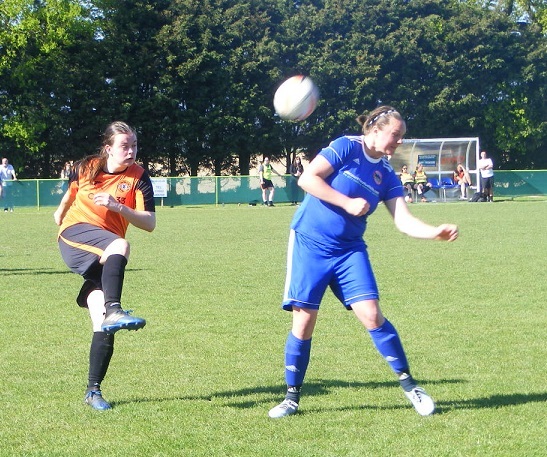 This entry was posted in Cup Final, Match Reports, Norfolk Ladies League Cup and tagged Bungay Town Ladies, Cup Final, FC Sprowston Ladies, Match Report, Norfolk Ladies League Cup on May 7, 2018 by WFEast. The mid-week action on Women’s Football East features a top of the table clash from Norfolk Women’s Division One with 2nd placed Bungay Town Ladies hosting 3rd placed Thorpe United Ladies, both sides still very much in the title race. 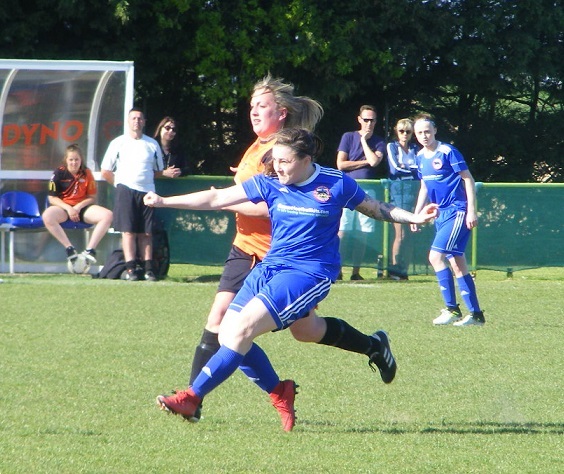 Sprowston’s young guns the side to chase down as they lead the way by 6 points extending their lead with a 2-0 home win over Bungay Town Ladies on Sunday. Bungay Town have 2 games in hand on the leaders the 1st tonight against Thorpe United Ladies. Sprowston will be interested observers. My 1st look at both sides this season. A good sized squad Bungay Town have lost several through injury however some long term, their goalkeeper suffering a broken wrist early in the game against Sprowston amongst Bungay Town’s injured players. Scoring plenty of goals with a potent strike force this season Emily Leach and Samantha Walker scoring 24 and 22 each respectfully so far this season, goals too coming from the midfield with Nicola Hazell and Selina Rowland scoring 32 goals between them. Thorpe United Ladies have been playing catch up in the league all season have had several long spells without a game throughout the season. An experienced squad with a number of their U16s side taking the step up into adult football this season. Are the only side left unbeaten in the Norfolk County Leagues with 8 wins and 3 draws from 11 played so far. Well placed behind the leading pair to make a push for the title. Shanice Sutton having an excellent season in front of goal scoring 33 so far from 15 appearances. Didn’t want to play in mid-week their squad stretched a few unavailable including regular captain striker Rebekah Lake. The two sides have met twice already this season drawing 2-2 in the league back in February, then in the semi-finals of the League Cup the sides shared 7 goals Bungay Town winning 4-3 to reach a 2nd successive final where they will be defending the trophy won last season against FC Sprowston Ladies. Maltings Meadow the venue for this evenings match a hive of activity as usual. Bungay Town selected as one of the FA’s new SSE Wildcats centres their first session held before the game. The main pitch looking in great condition a good size overlooked by the clubhouse in one corner. The weather alot cooler than it was at the weekend today a typical April day sunshine and heavy showers. Clouds looming over the ground it would stay dry for the match. Bungay Town Ladies starting XI – Jody Wells, Kelly Collins (C), Ella Swift, Charlotte Power, Hannah Jones, Teo Ille, Selina Rowland, Lyndsey Adams, Nicola Hazell, Emily Leach & Samantha Walker. Subs – Arianna Lloyd & Eva Evans. Thorpe United Ladies starting XI – Cara Anderson, Aneliese Smith, Vicky McNorton, Shannon Holmes, Bethan Sommerfield (C), Laura Hedtke, Charlotte Groves, Sharnie Boast, Kirstie Andrews, Leonie Daulby & Shanice Sutton. Subs – Vicky Monsey & Lisa Ferdani. Both sides not in their regular colours this evening, Bungay taking kick-off 1st half in their all red kit with white trim. Thorpe in their lime green away shirts with black across the chest and shoulders with black shorts and socks. Possession lost from both sides as they close the ball down at the start no one getting hold of it in the middle of the park. Selina Rowland bringing it away moving out to the left looks to play it on up the line for Samantha Walker to chase, Thorpe captain Bethan Sommerfield going with her winning the tackle. Bungay get bodies forwards Teo Ille with the pass forwards for Emily leach up top has Walker to her right they exchange passes shifting the ball out to the left side of the area with Nicola Hazell bringing clear, going a little early she is flagged offside. Leach holds the ball up inside the D back to goal pushes it out to Walker to the right of goal 25 yards out her first time strike rising over the goal. A bright start from Bungay Rowland with a powerful run forwards as Hazell travels with the ball up the left wing her through ball aiming t pick her out too heavy Thorpe goalkeeper, Cara Anderson able to gather. Thorpe with the ball on the left the pass played on for Sutton in attack she knocks it forwards looking to get into the box, Charlotte Power going with her the central defence lunging in ahead of her to take the ball. GOAL! Bungay starting the brighter it’s Thorpe who open the scoring, the ball won in midfield the past through to Sutton central Power with her the defender initially winning the ball, Sutton stays on her pressuring her as she takes the ball away to the byline on the left, Sutton getting the better of her nicking the ball shifts in a from the acutest of angles sends a shot in towards goal the high ball flighted perfectly goes across the goal to nestle inside the far post 0-1. Rowland is causing problems for Thorpe the Bungay midfielder winning the ball and breaking forwards well to support the attackers. Sets up Walker for a shot 25 yards out her low effort not troubling Anderson. A huge blow for Thorpe as Sutton pulls up hurt inside the Bungay area as she looks to put in a challenge on Power. Looks like her knee is in alot of pain a real blow after lengthy treatment on the pitch can’t continue is carried off Vicky Monsey readied and sent on to assist Leonie Daulby in attack. GOAL! Doesn’t take Bungay long to find a reply finding the levelling goal. Rowland running on after a long pass on the right picking it up carries it into the area from the byline on the right draws Thorpe players to her evading a challenge sends it into Leach who finds herself unmarked in the centre of the six yard box places the ball wide of the keeper to make it 1-1. Laura Hedtke wins the ball in the middle for Thorpe her pass into Sharnie Boast, she attempts the through ball into the area for Monsey to chase down, Hannah Jones cutting it out and clearing for Bungay. Bungay turn play around quickly Rowland bringing it forwards looking to send Hazell through from the left into the box the pass too close to Anderson the keeper coming out to the edge of her area to claim the ball. GOAL! Bungay turn the game completely around taking the lead pushing players forwards up the right Lyndsey Adams with Walker the cross swung into the area Hedtke back to head it away with Rowland making the run into the box, the Bungay midfielder holding her position as possession is reclaimed on the right the ball fired into her opens up her body to steer the ball past the keeper into the bottom corner 2-1. Bungay make a change after the goal Walker coming off Eva Evans coming on. Rowland continuing to cause problems for Thorpe her runs not being tracked picks up the ball sending the pass on for Leach her switch out to the left sees Evans caught offside. Thorpe have lost their edge in attack without Sutton winning the ball in midfield Bungay are dealing with any forward pass, Ella Swift with a good tackle against Kirstie Andrews over on the left. Daulby with a pass up into the box Jones clearing for Bungay, Charlotte Groves nipping in to win it back drops her shoulder getting past her marker, her forward ball for Monsey she is flagged offside in the area. Adams with the ball in midfield for Bungay inside from the right plays the ball back to Rowland her diagonal ball releasing Leach out to the left moving on to the byline her cross fired across the top of the six yard box intercepted by Vicky McNorton for Thorpe. A good save by Anderson as Leach is put through in behind 20 yards out Anderson out to the edge of her area stays big as Leach smashes her shot against her. GOAL! With 5 minutes left to go in the 1st half Bungay extend their lead. Rowland with the run forwards central on the ball up to the top of the area the ball played inside to Hazell she leans back opening the angle to curl her low shot into the bottom corner of the net 3-1. GOAL! Late into the 1st period and Bungay have another goal. Pressing forwards through the middle Rowland involved the ball out to Hazell moving right her cross in cut out by McNorton inside the box her clearance not finding a teammate the ball played all the way across the area into the six yard box Evans free at the far post putting the ball into the back of the net 4-1. A strong 1st half from Bungay the hosts having the better of the game started well fell behind. Injury to Sutton unsettling the visitors Thorpe not able to retain the ball Bungay winning it back easily breaking on with purpose players finding room and space to exploit. Scoring to goals late in the half to put them firmly in control of the game. Half-time a chance for Thorpe to get together try and regroup unsettled feeling decisions are going against them try and galvanise themselves for the 2nd half a better display needed if they hope to find a way back into the game. Thorpe to get the 2nd half underway have make a change, Lisa Ferdani on for Monsey, Into the midfield Groves is pushed into an attacking role through the middle. Straight from kick-off the visitors look to press the ball higher up the pitch, Andrews trying to get in behind on the right Swift with the tackle. Bungay make a change bringing Walker back on for Evans. Thorpe bring the ball on Andrews left the ball put inside to Ferdani played on to Smith on the right, Kelly Collins winning it back for Bungay. Thorpe showing more intent at the start of the 2nd half Andrews with a clever back heel on the left wing putting the return pass into Groves she tries to put Boast through on the left Bungay putting it out for a throw in. Boast seeing the ball into her feet left corner outside the box drives a shot in towards goal Wells covering her near post takes the ball cleanly. Ferdani passing the ball on for Andrews left side the defender looking to see it out fr Bungay Andrews doing well to slide in knock the ball into her to win the corner. A great delivery into the box Groves rising to meet it six yards out her header blocked/saved at close range Bungay scramble it away. Thorpe regaining the ball right side the early ball played into Groves positioned top of the area stretching for the ball a little screws her shot in wide of the target. Groves strong up front battling for every ball for Thorpe the Bungay defence not letting her have any room to turn and shoot inside the area. Sommerfield tackles Walker as the number 10 looks to run through on goal the ball out to McNorton who clear it up the pitch, the pass on looking to send Andrews away on the left the Bungay defence intercepting knocking it on long out for the corner.. at least Thorpe think so play brought back instead for offside a decision that further riles Thorpe’s sense of injustice. Bungay make a change Adams the player off, Arianna Lloyd taking up her position on the right. Power with the ball up field into Walker making a run into the area looked like a push on McNorton, Walker getting a shot away Anderson making a good save. GOAL! 20 minutes played in the 2nd half and Bungay having kept Thorpe from finding an early reply 2nd half build momentum and further extend their lead the ball won back in the middle played on for Walker she knocks it around the advancing keeper at the top of the area in behind an empty goal to aim at doesn’t miss 5-1. Bungay look to press the advantage,Hazell with a powerful run on the left getting into the area her shot in rising strikes the crossbar dropping down falls to Lloyd coming in from the right she looks to smash the ball back in across the keeper Anderson getting the tips of her gloves to the ball knocking it up onto the bar again before Thorpe get back to scramble it away. Holmes blocking a shot from Leach taken from 20 yards out. Ille moving left with the ball her cross fired into the area McNorton getting her head on the ball to Thorpe with Walker coming in behind her. Thorpe get forwards Boast and Andrews looking to link up on the left the return ball form Boast gathered by Wells inside the six yard box. Groves back to goal top of the area twists and turns can find no room past Power. Bungay turn play around rapidly the pass long to the left finding Leach on the break her early ball played onto Walker running clear in the centre to of the area her first time shot angles away from goal wide at the far post. GOAL! Closing in on the final 15 minutes Bungay find the back of the net for a sixth goal. A throw won on the left level with the top of the Thorpe area the ball played onto towards the edge of the box his headed down into Walker right of goal unmarked she leans back into the shot and sends it across the keeper to score her 2nd of the game 6-1. A free-kick awarded to Thorpe 5 yards inside the Bungay half. Smith over it an ambitious effort in at goal the ball dipping late but not coming down soon enough lands on the roof of the net. Thorpe bring Monsey back on into the action in place of Smith. The visitors losing their way late in the game Bungay taking full advantage. GOAL! Bungay go further in front as they produce a flowing attacking move through the middle the ball from the back helped on for Leach the Thorpe defence split open, her run taking her to the top of the area the striker sends her shot low past the advancing keeper to score 7-1. GOAL! Walker going on to complete her hat-trick moments later Bungay attacking on the left the diagonal pass fired into Walker outside the area top left corner, seeing the ball into her feet the striker turns and strikes the shot across the goal into the bottom corner to make it 8-1. 8 minutes left to play Thorpe have lost their shape Bungay finding room all over the park. Thorpe get hold of the ball release Andrews into the box left of goal attacking players closing her down, the keeper going to ground she puts her effort wide of the near post. Rowland bringing the ball on out to the right a one two between Swift and Lloyd right side the cross in Walker putting her shot wide. Walker with another strike top of the area blocked by Holmes the deflection into Lloyd her shot whistling over the crossbar. GOAL! Into stoppage time Bungay get another goal, players getting forwards the pass through the middle finds Hazell on the move in the left channel reaching the area pulls the trigger her shot driven across the keeper and into the net beyond 9-1. An opportunity to make it double figures at the death spurned by Walker as she stabs the ball over from six yards as the ball squeezes past the keeper at the near post as she tries to stop a cross in low from the left. The last action of the game Bungay celebrate a comfortable win. Bungay bring an end to Thorpe’s long unbeaten league run and with a dominant scoreline. Coming back from an early setback to press their advantage first half Rowland causing mayhem with her runs, Bungay getting into a 4-1. A blow for Thorpe losing Sutton to injury and without Lake too lost their edge up top rallied at the start of the 2nd half but as decision’s went against them lost their discipline and Bungay took full advantage. Bungay getting into a 5-1 adding a flurry of goals in the final 1 minutes to see Thorpe suffer a heavy and very uncharacteristic loss. A dent to their own title ambitions, certainly not out of it yet and can only put this result behind them start with a clean slate next time out. Bungay with the win back getting their own title challenge back on track close the gap to Sprowston to 3 pint with a game in hand. A good performance all round from Bungay this evening a few contenders for the Women’s Football East – Player of the Match have chosen Selina Rowland her work in midfield causing Thorpe all sorts of problems especially 1st half making some excellent runs drawing players out of position and setting up opportunities in front of goal aswell as getting on the scoresheet with a goal. Good to see both sides in action at last this season, although I’m sure Thorpe would rather I hadn’t. My thanks to both clubs for their help with the team details always appreciated. More action from Norfolk to come later this week on Friday with Acle United Ladies playing Wymondham Town Ladies in the Norfolk Women’s County Cup Final. 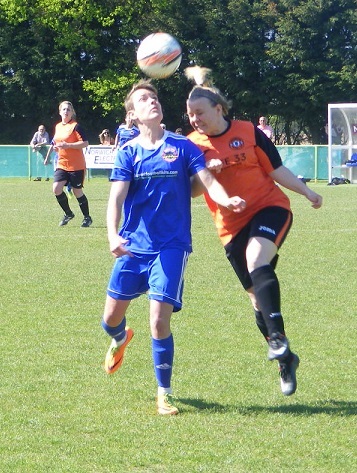 This entry was posted in Match Reports, Norfolk Women's Division One and tagged Bungay Town Ladies, Match Report, Norfolk Women's Division One, Thorpe United Ladies on April 26, 2018 by WFEast. Sunday’s football action on the Supporting Women’s Football Blog came from the Norfolk Women’s Division One with in form Bungay Town Ladies in 4th place in the league winning all of their matches in 2017 to date travelling to play Brandon Town Ladies on a bitterly cold day in on of the few games to beat the weather in the league. After a trip to The Hive yesterday to see the opening match in the FAWSL 2’s new one off Spring Series competition between London Bees and Brighton & Hove Albion WFC, stayed local for this Sunday’s women’s football action travelling over the border into Suffolk to watch the Norfolk Women’s Division One match between Brandon Town Ladies & Bungay Town Ladies. With snow all around the country the ground already very wet it looked like ti was going to be another weekend full of postponements, even the FAWSL’s new Spring Series didn’t survive unscathed. Didn’t have a Plan A this weekend not committing to game too early having seen 3 called off already this year. Had a short list and Brandon Town Ladies v Bungay Town Ladies was on it 20 minutes away the snow that was on my lawn was thawing rapidly even if it was still bitterly cold, extra layers on hit the road. Norfolk Women’s Division One is a very competitive league although this season so far it is being dominated by Thorpe United Ladies who have won all 9 of their league games so far and excellent run of form has seen Kings Lynn Town Ladies overhaul newly promoted North Walsham Angels Ladies who lay 3rd going into this weekends match due to play each other this Sunday at North Walsham the game was postponed, giving an opportunity to 4th placed Bungay Town Ladies to move above them. Brandon Town Ladies go into today’s game in 6th place in the table well clear of the bottom 2 sides, have had a frustrating season so far in the league with 3 wins 1 draw and 4 losses postponements and having players unavailable for some games hasn’t helped them build any momentum. Have had a good run in the League Cup competition and will play today’s opponents, Bungay Town Ladies away in the semi-finals of the competition. Today is their 3rd meeting in the league with Brandon winning 4-3 at the start of the season at home, then losing away 4-0 back on the 15th January. Bungay Town Ladies got off to a bad start in the league this season losing their opening 3 games. Recovered towards the end of 2016 winning twice in the league. Have had an excellent run in 2017 getting regular matches in winning 3 in a row in the league given a home win in the League Cup quarter finals. Spoke to manager Graham Purling during the summer at a pr-season friendly and he was optimistic about the squad the club had assembled this season. Brandon Town Ladies play their home matches at the Brandon Leisure Centre, a multi-sports facility offering several full-sized football pitches. Despite the amount of rain and dusting of snow to hit the country over the past few days the pitch had held up well, looked muddy but had featured a game earlier in the day and despite being cut up it was surprisingly dry underfoot no standing water. A large pitch, it was a bitterly cold afternoon, gloomy with dark clouds all around. Brandon Town Ladies starting XI – Shannon Odebrecht, Melanie Talbot, Cassandra Carvalheira, Shanice Burch, Laura Grove, Chloe Slater, Carolyn Sarafian, Ruby Robertson, Frankie Torrance (C), Brooke Wickens & Elicia Cooper. subs – Hazel Shepherd, Lauren Riding & Emma Johnson. Bungay Town Ladies starting XI – Ruth Smart, Hannah Jones, Kelly Collins (C) Jessica Keeling, Charlotte Power, Inna Marx, Ella Hindley, Nicki Hazel, Lauren Purling, Laura Holden & Stephanie Cool. Both sides had a newly registered signing in their squad for today’s game, Elicia Cooper starting in attack for Brandon Town Ladies. Rebecca Rylott, Bungay Town Ladies only available substitute. Bungay to kick-off the 1st half wearing sky blue shirts, black shorts and socks, with Brandon lined up opposite wearing yellow shirts and socks with blue shorts. The ball gets played long out to the right for Lauren Purling to chase early on winning a throw the ball is lifted up the line for striker Stef Cool getting into the box her ball forwards his cut out by Brandon’s Cassandra Carvalheira behind for a corner kick. Headed out of the area by Brandon they look to counter attack on the right players from both sides racing back towards the Bungay goal as the ball is played into the feet of Brooke Wickens coming in off the wing to get into he area is challenged by Bungay’s Charlotte Power winning the ball back for the visitors. The action is end to end in the early minutes both sides contesting the ball hard in midfield Wickens plays a great crossfield pass from right to left picking out captain Frankie Torrance on the wing drives forwards looking to get into the box, no way past Bungay right back, Hannah Jones who stands her ground times her tackle well. Both sides looking to exploit the wide players, Inna Marx sends the ball out to Nicki Hazel on the left pushing on crosses as reaches the top of the area the ball angling towards the near post caught by Brandon Town Ladies goalkeeper, Shannon Odebrecht. GOAL! The opening goal of the match comes after just 6 minutes of play, Brandon pressing forwards in attack lose possession the ball is played direct through the middle both Cool and Laura Holden are in through on goal as Odebrecht comes racing out to the edge of the area with Cool closest the keepers clearance doesn’t go far striking Holden inside the D, gets a shot away, Odebrecht doing well to get a glove on the ball palms it into the ground isn’t under control Holden gets to it 1st to send the ball centrally into the back of the net 0-1 to Bungay. Brandon attack from the restart getting a throw deep on the left played into Carvalheira her cross from 35 yards out is a good one coming in high Ruby Robertson gets up to head the ball can’t direct her effort on target as it bounces wide across the six yard box. Wickens in possession on the right plays the ball in field to Carolyn Sarafain the midfielder in front of the centre circle decides to have a pop at goal on target is straight at Bungay goalkeeper Ruth Smart who takes it cleanly into her body. Making progress with the ball on the right Brandon have a throw players drift across as the throw is taken is Elicia Cooper squares the ball in towards Torrance outside the area in front of the D, back to goal hits the half volley on the turn her strike bouncing wide past the far post. Another good crossfield ball from Wickens on the right picks out Torrance on the left cuts inside rolling the ball in field to Sarafain outside the area shifts the ball before hooking a shot in towards goal, again her effort drops into the keepers gloves back on her line. Robertson gets back on Cool as she breaks for the Brandon area, tackling concedes the corner kick played in from the right by Hazel his headed clear of the area by Laura Grove coming back out to Hazel sweeps a cross into the box Jones gets her head to the ball 10 yards out sends her effort over the crossbar. Picking the ball up from a throw on the right 30 yards out Ella Hindley turns inside carrying the ball towards the Brandon box, scoops the ball up off the turf sending a shoot in towards goal, isn’t too far over as it dips late over the bar. Hindley with a run through the centre of midfield lays the ball on for Purling on the move up the right wing, Shanice Burch comes across to tackle her gets a knock as she puts the ball out for the throw deep in the corner up okay after treatment. A few crunching challenges about the pitch Marx and Sarafain clatter into each other from to try and win a 50/50 ball (poor thing). Pressure on the ball from both sides, Bungay are a little more successful with the final ball isn’t coming off for Brandon. The visitors winning another corner on the right the ball is lifted into the centre of the goal Odebrecht calls and take well before being bundled over by the onrushing Bungay attacker to get a free-kick. A corner from Bungay on the left sees Brandon goalkeeper Odebrecht pull off a superb save the best I suspect I’ll see this year! Initially doesn’t do so went coming into the crowd at the near post to punch the ball away, instead knocks it down into the ground, players scramble for the ball is squeezed out to Hindley inside opposite the far post, I’m standing on half way behind goal as she shifts the ball with her 1st touch has an open goal to aim at hits the ball goalwards should be a certain goal, however out of no where Odebrecht appears throwing herself full stretch low across her goal-line to glove the ball away for the corner an excellent piece of goalkeeper, had it been Karen Bardsley the Vine loops would be in there thousands as it is you will just have to take my word for it! A powerful run on the ball from Brandon’s Wickens through the middle moves to the right looking to make the angle for a shot, Bungay captain Kelly Collins gets back at her to slide in to tackle and win the ball back. The counter attacking football keeps coming Brandon’s Chloe Slater on the move up the pitch plays it on for Carvalheira ahead of her on the left has Sarafain keeping pace with her lays the ball off into the middle, into the midfielders stride she 30 yards out she goes for the 1st time shot her strike whistling over the bar. Brandon make a change up top bringing off Cooper and sending on Hazel Shepherd as Bungay win a corner with Purling played in down the right the ball is played into the six yard box deep knocked out towards the edge of the area Jess Keeling up from the back gathers for the visitors stabs a shot in towards goal his held on the line by Odebrecht. Hazel with a good run up the right side for Bungay lays the ball into Hindley on the move towards the Brandon area gets a shot away as she is closed down by Burch bounces wide of goal. Brandon have upped the tempo as the 1st half moves into the last 5 minutes but have yet to test Smart in the Bungay goal. A throw on the right side is played into Brandon’s Shepherd 25 yards out from goal driving forward looks to play in Torrance making a run from the left into the area, Jones throws out a long leg to intercept the ball. One last attack in the 1st half for Bungay Purling on the left forwards for Cool to chase hits the shot from outside the area runs all the way along the ground to be scooped up safely by Odebrecht inside her six yard box. An high paced and exciting 1st half of football, Bungay Town Ladies with the narrow advantage have created the better chances in front of goal. Is bitterly cold however and I can’ blame them for wanting to keep the ball moving. A shortened half-time interval as both sides stay by the side of the pitch. The visitors getting into some good attacking positions Purling and Hazel a threat out wide, Holden just 16 with some dynamic runs through the middle supporting Cool in attack. Brandon with some good build up play their final ball just not finding it’s mark. 45 minutes left to play. A change for Bungay at the start of the 2nd half with Rylott coming on in place of Hazel going into a wide right position. Brandon get the 2nd half underway, Bungay get possession and attack down the right keeping the ball in the final 3rd before the ball is played inside to Cool outside the box slicing across the ball be strike races wide across the area out for the goal-kick. Sarafain gets forwards for Brandon the ball put into her feet by Wickens goes to strike the ball from outside the box a knick off a Bungay defender diverts the shot straight into Smart’s gloves. Both sides continue to press the ball keeping up the pace of the 1st half. Shepherd is played on down the right wing by Carvalheira her cross in to the area intercepted by Collins. Holden picking the ball up from deep goes on a run through the middle heading for the Brandon box is tracked all the way by Slater who slides in to take the ball play it back to her keeper. Torrance and Wickens link up on the left side the through ball from Torrance just a little too heavy for Wickens running into the box Smart coming off her line can get there 1st. Up the other end Odebrecht is quickly out of her area to kick the ball as Rylott plays Cool in behind the defence. Bungay break from a Brandon corner the ball played out to Purling on the left side Talbot gets across diving in to put the ball out for the throw. Purling takes a knock in the challenge but is up on her feet from the throw the ball is worked down the line by the visitors finally being played into Purling just inside the box on the left turning she is caught as a Brandon defender lunges in to try and win the ball, the referee stops play Purling clearly coming off the worse, after treatment can’t continue and is substituted Hazel returning to the pitch. Brandon also make a switch Cooper returning to the pitch in place of Shepherd. Holden nips in to win the ball from the Brandon back line has Cool and Rylott either side of her as she heads towards the box tries to pick out Rylott to her right the pass a little too heavy Rylott keeps it in play before winning a throw level with the box, the ball is played down to Marx’s feet puts the pass inside for Holden who seeing the ball into her body turns and hits the ball on the volley her shot angling in at head height towards the ear post, Odebrecht has it covered takes the ball cleanly. Brandon have a free-kick wide right outside the box after Hazel handles the ball, Slater over the set-piece sends the ball high into the area Hindley heads the ball clear for Bungay they counter attack the pass out towards Hazel on the left side travelling with the ball turns infield heading for the area pulling the trigger 25 yards out the shot straight at Odebrecht the keeper claiming the ball on her goal-line. GOAL! 20 minutes into the 2nd half and Bungay double their lead pressuring the ball as Brandon try to play it out from the back Holden wins the tackle takes the ball on into the area before prodding it forwards for Cool right side of goal close range rolls the ball past the keeper and into the back of the net 0-2. Shepherd returns to the action for Brandon winning a corner on the right side bring players forwards, Hindley defends for Bungay winning the near post header giving away 2 more corners before the visitors break from the 3rd the ball played long out to Cool on the left on halfway gives it to Holden who surges forwards moving left has Hazel with her their runs taking them across each other Holden leaves it for Hazel who strikes the shot from outside the box the ball flying narrowly over the crossbar. The sun finally makes an appearance late in the day breaking through the clouds, Bungay attack the ball played into Cool’s feet outside the area to the right has Hindley making a run towards the area lays the ball into her path Hindley striking the shot 1st time gets plenty of power behind the shot is straight at Odebrecht again and the keeper makes the save. Brandon bring the ball forwards through the middle Shepherds strike is deflected out for a throw level with the top of the area played into Sarafain’s feet the midfielder turns and looks to curl a shot in towards goal from inside the D, dips late but not enough to take it below the crossbar. Bungay get the ball up the other end Hindley steals the ball inside the box as it comes in from a throw-in works room for a shot left side the ball is held by Odebrecht as Cool looks to pounce on any follow-up. GOAL! Bungay don’t let Brandon out of their final 3rd from the previous attack closing players down outside the box, it’s Holden who regains possession moving towards the top of the area left of the D rolls the ball into the area for Cool who on the opposite side to wear she scored her 1st goal does exactly the same placing the ball across the keeper from inside the six yard box to score her 2nd a see Bungay take a 0-3 lead with around 15 minutes left on the clock. Marx gets hold of the ball for Bungay some 30 yards out from goal time to line up a shot, places her strike wide across the Brandon goal. Bungay are finishing the game strong Purling her knee bandaged up returns to the field in place of Rylott. Brandon keep going forwards when they have the ball getting to the top of the Bungay area the final ball just won’t fall to an attacker, Jones blocking a strike from outside the box by Shepherd. Torrance rifles a shot in from the wide left position, Smart coming across to cover her near post can see the ball wide into the side netting. Wickens marked by 3 players wide right wins Brandon a throw the ball played into her wide of the box helps it inside to Slater looking to play it across the face of goal, the ball is too close to Smart, spilt however the corner is given away. The delivery from the corner drops into the crowded six yard box Smart can’t get hold of the ball dropping down a shot comes in too many bodies in front of goal the ball blocked spins out to the right the shot angled in towards goal Smart gets down sharply on her goal line to make the save. A chance for Cool to claim her hat-trick late in the match as Holden picks up the ball and carries it forwards has Hazel with her, Holden rolls the ball to her, Hazel lays it on for Cool to her right squeezes the ball past the defence to get into the box, can only pick out the goalkeeper as she gets a shot away. A 3-0 win for Bungay Town Ladies sees them keep their winning run in 2017 going and the 3 points moves them level on points and above North Walsham Angels Ladies into 3rd place in the Norfolk Women’s Division One table. Kept up a high tempo throughout the 90 minutes closing the ball down getting forwards always looking a threat creating the better chances in front of goal. A good contest that highlights just how competitive the league is. 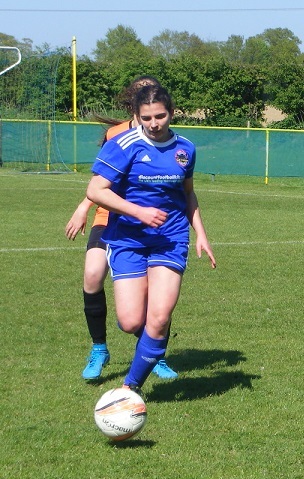 With a 1st half goal and 2 assists in the 2nd half the SWF Blog – Player of the Match today is Laura Holden, the 16 year old playing just her 2nd game for Bungay not letting Brandon settle on the ball, getting the tackles in to win the ball and carry it forwards. My thanks to both clubs for their assistance today. This entry was posted in Match Reports, Norfolk Women's Division One and tagged Brandon Town Ladies, Bungay Town Ladies, Match Report, Norfolk Women's Division One on February 13, 2017 by WFEast. A Women’s FA Cup double on the Supporting Women’s Football Blog this weekend 2 ties from 2nd Round Qualifying with the 1st of 80 ties being played on Saturday night. A special occasion for Bishops Stortford Ladies playing at the men’s club, ProKit (UK) Stadium. Their opponents for the tie Bungay Town Ladies. Match report below. Football from the Women’s FA Cup on the Supporting Women’s Football Blog, some 80 ties drawn for 2nd Round Qualifying of this season’s competition with a total of 254 clubs being accepted in total to compete. This weekends action get’s started on Saturday an evening kick-off for Bishops Stortford Ladies v Bungay Town Ladies, the venue for the tie, Bishops Stortford Community FC’s, ProKit (UK) Stadium. Bishops Stortford Ladies are new entrants to the Women’s FA Cup this season which sees an increased prize fund for all rounds this year, still a pale drop in the ocean but progress nevertheless £450 for the winning side and of course the ultimate prize is a final at Wembley Stadium. Compete in Beds & Herts Women’s Division One having been promoted rapidly through the 3 divisions since the current set-up was formed 5 years ago. Finished 4th in the league last season. Have a strong youth set-up with teams from U12 through to U18 competing several of their starting line-up tonight having been with the club all the way through the youth sides. An exciting opportunity for the ladies side to play at the men’s ProKit (UK) Stadium, Bishops Stortford Community FC compete in the Conference South. The season has barely started in the Beds & Herts Women’s League and Bishops Stortford Ladies didn’t play in the opening round of fixtures tonight’s Women’s FA Cup tie being their 1st competitive game of the season. Bungay Town Ladies are the visitors today this their 3rd year in the Women’s FA Cup after a 2 season absence are looking for advance in the competition for the 1st time. Competing in Norfolk Women’s Division One an established side in the league played their 1st league game of the season last weekend. With strong support form the men’s club that run a number of youth teams for both boys and girls. From a personal point of view running Women’s Football East, I’m always intrigued to see how the various leagues across the region match up and the Women’s FA Cup provides a great opportunity to see sides comes together in competition. The FA Cup whether it’s the men’s or women’s game captures the imagination players and fans alike. Bishops Stortford Community FC’s ProKit (UK) Stadium is just off the M11 behind the Birchanger Motorway Services a regular stop off for myself on the way home from London after a women’s football game to write up a match report. The stadium is at the end of an industrial estate on the way into Bishops Stortford itself. A large carpark the stadium boasts great facilities a large bar and clubhouse, refreshment booths for hot food and drink a good sized main stand overlooking the dugouts. a smaller seated stand far side. A quality playing surface nice and flat, plenty of grass cover both sides looking forwards to playing on it. Well summer has come to an end had to happen sometime had a long run the heavy rain on Friday bringing in an autumn feel to the evening cool with a misty drizzle blowing across the pitch as the two sides walked out of the tunnel. Bishops Stortford Ladies starting XI – Sophie Parslow, Sophie Cook, Louise Crocker, Natasha Atkinson, Chloe Haken (C), Megan Kenny, Jess Croney, Yasmin Smith, Samantha Tant, Brogan McHale & Kathryn Stanley. Bungay Town Ladies starting XI – Ruth Smart, Kelly Collins (C), Lois Nethersell-Webb, Charlotte Power, Annie Piper, Ella Hindley, Inna Marx, Rebecca Carver, Lauren Purling, Emily Leach & Lacey Andrews. 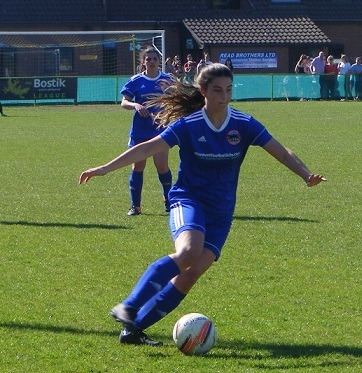 subs – Emily Coe, Sian Carter, Megan Vincent, Nicola Hazel & Jordan Duke. Two sides who are used to playing roll on roll of substitutes in their respective county leagues the rules change in the Women’s FA Cup, 5 substitutes can be named on the bench of which only 3 can be used. Bishops Stortford to get this 2nd Round Qualifying tie underway taking kick-off 1st half wearing blue and white vertical striped shirts, blue shorts and socks with Bungay lined up opposite wearing sky blue shirts, black shorts and socks. An early ball from midfielder Megan Kenny for Bishops Stortford out to Yasmin Smith attacking down the left wing looks to knock the ball on down the line, Bungay captain, Kelly Collins at right back gets across her to make the tackle put the ball out for a throw. Winning the ball back in their own half Bungay play the ball long up to striker Lacey Andrews on half way spins away to the right same result as Lauren Crocker puts the tackle in conceding the throw, taken quickly Bungay’s Lauren Purling takes the ball down the the wing before whipping a high cross into the Bishops Stortford six yard box, goalkeeper Sophie Parslow palms the ball down cleanly the sets up a quick counter kicking the ball long out of her area helped in in the middle striker Brogan McHale latches onto the ball driving forwards shoots early from outside the box, Bungay goalkeeper, Ruth Smart gathers the shot. A spell of possession on the right inside the Bungay half for Bishops Stortford brings them the 1st corner of the match. The ball is lifted high in towards the near post, helped on falls to captain Sophie Haken waiting far post looks to hit the ball back across the goal face, her shot blocked the rebound runs to Crocker top of the area she shoots same result, Bungay block. Samantha Tant receives the ball on the right wing drives towards the top of the area before spinning wide again to avoid a tackle down the line wins a corner. A strong punch from Smart this time coming through bodies at the near post to clear for Bungay. Bishops Stortford doing well early on, have a free kick on half way, Smith over the ball sends it up towards the Bungay box, Inna Marx heads the ball away for Bungay, Smith with another opportunity to swing the ball into the area comes in high, McHale tries to bring it under control, before she can is closed down by the visitors defence. Breaking up the left side Rebecca Carver sends the ball on down the wig for Andrews strong running to get into the area with the ball slips on the slick surface as she goes to shoot. The game is starting to even out a little more, Bungay finding room for their midfielders, Marx and Ella Hindley to get on the ball spread the play with Andrews moving all the way across the back line, Marx sending her away on the left, Natasha Atkinson gets back to pressure her run, Purling coming across to the near post to support the corner is conceded. Bungay have two opportunities to play the ball into the area from the corner the 1st cleared for a 2nd corner, this one drops amongst the bodies congregating near post the ball is turned wide of the post, a goal kick is awarded. GOAL! The visitors take the lead on the 20th minute. Purling running with the ball down the right wing plays the ball into Andrews inside the box right of goal brings the ball down, quickly closed down to way to turn and release a shot instead plays the ball across the area with Carver free just outside the area, hits a low strike with pace towards goal zipping along the wet surface, Parslow sees it late her dive in vain as the ball rolls in at the near post 0-1. Corner for Bishops Stortford soon after the restart the ball is played up towards the face of the box too high for Crocker, Atkinson beyond her can’t control, but manages to help it on for Haken stretching for the ball sends a high ball wide across the face of goal. End to end no sooner has Purling reaching the byline on the right for Bungay put her cross behind goal then then the home side break, Kathryn Stanley getting hold of the ball and passing it out to the left with Smith looking to get in behind, Bungay’s Charlotte Power getting across to play the ball out for the throw. Power in the middle at centre back is on hand twice in quick succession as Stanley coming a little deeper to receive the ball tries to put McHale in through the middle, Power intercepting on both occasions. It’s Power’s centre back partner, Annie Piper who gets across to deal with Stanley then as she picks up the ball from Jess Croney and turning drives into the box on the left. Bungay pushing towards the Bishops Stortford box lose the ball Atkinson clearing it along way up field, Smith after it gets away down the left into the box hits the ball hard across the six yard box, her cross/shot going wide McHale racing in far post unable to turn it home. McHale with a shot from 25 yards out in a central position the ball played through the middle from a goal kick, turns and unleashes the shot the ball screws away from goal. Marx over a free kick wide on the right for Bungay plays it up towards the box headed clear, Hindley wins it back passes to Purling on the right sends her cross high into the area far post Andrews hooks it back into the middle, Emily leach back to goal looks to bring the ball down, Sophie Cook closes her down, tackling to send the ball clear of the box. Croney plays the ball up to Stanley putting her clear on the left, charging towards the box checks her run coming inside to shoot, looks to curl the ball into the top corner, not enough height on the ball is taken cleanly by Smart. Both sides using the full width of the pitch enjoying to slick surface the ball moving from one end to the other, McHale has been back helping her defence, breaks forwards now a burst of pace seeing her get ahead of the Bungay defence lets fly from outside the box the ball runs wide of goal. Bungay get up the other end see a goal chalked off for offside, Lois Nethersell-Webb playing it on up the left for Carver the ball whipped in across the six yard box is turned in won’t count. Marx is over another Bungay free kick inside the Bishops Stortford half plays the ball in from the right, cleared from the area, Hindley rolls it back to Marx tries again plays the ball towards the far post area, Leach is their headers the ball but can’t direct it on target. Bishops Stortford attack down the right as the 1st half draws to a close , McHale and Tant link up the latter tries to play Stanley through into the box, Power cuts out the pass her clearance going to Cook, sends a diagonal ball into the area with Smith looking to get in behind everyone, Smart is able to claim it before she can reach it. A narrow advantage to Bungay at the break, has been a fast paced 1st half both sides working the ball up the wings using the whole pitch with neither overly testing the opponents goal. A lot of energy has been put in the 1st 45 minutes. One goal in it still all to play for 2nd half. No chances at the start of the 2nd half Bungay to kick-off. Early opportunity for Andrews to have a strike on goal, the ball played into her in a central position from the right, given time to turn hits the strike from 30 yards out runs wide across the area. Parslow reacts sharply inside her box with Bungay pressing on the right Purling lifts the ball up into the area, Andrews after it the keeper drops to smother the ball right side of her. Bungay win a corner on the right, goes long to Andrews drives the ball in towards goal is cleared back out to Marx puts the ball back in to the near post comes to Leach catches her a little flat footed prods the ball wide. Bungay applying alot of pressure at the start of the 2nd half are camped in the Bishops Stortford half on the right have a throw the ball with Marx passes to Andrews outside the area to the right of goal, unleashes a shot blasts the ball wide. Purling takes the ball down the right, cutting it back inside, Andrews that side inside the box misses her kick the ball runs on through to Carver left of the D outside the box this time her shot fizzed in low is the wrong side of the post. Carver receiving the ball from Nethersell-Webb carries it down the left before squaring across the top of the area looking to pick out Andrews, the Bishops Stortford defence cut it out the clearance rolls straight into Leach 25 yards out central shifts the ball then shoots the ball going a foot over the crossbar. A chance to relief the pressure for Bishops Stortford as they have a free kick on half-way, Croney to put the ball up towards the area, Piper heads clear, the ball is sent on up to Andrews through the middle goes on her own lets fly from 25 yards out the shot racing wide past the right post. Andrews is proving a real handful for the Bishops Stortford defence to deal with moving all over the place to receive the ball, tries to take the ball on down the left, Atkinson gets across tackles well to regain the ball then is fouled by Andrews as she goes to clear it. Hesitation at the back presents a chance for McHale as she robs Marx of the ball attempting a shot pass to Nethersell-Webb getting in behind the defense into the box right flashes her shot wide across the six yard box. Picking up the ball in the middle, Stanley with a clever twist, looks to have gotten away from Power at the back charging towards the box through the middle, Smart comes to close her down, Power recovers well to lunge in and push the ball way from the striker with her right boot playing it behind for corner. From the right 2 corners are put behind by Bungay at the near post the 3rd one going long runs to McHale top of the area, the ball is taken off her toe just as she goes to hit the shot. Tant gives Stanley the ball on the left inside the Bungay half, the Bishops Stortford attacker taking on the Bungay defence drives inside in towards the D runs it on to McHale as she is closed down, under challenge McHale squeezes a shot away the ball is blocked the rebound back with McHale, lifts the ball up across the area towards Tant at the far post six yards out headers the ball over the bar. Bishops Stortford make their 1st change Ashley Johnston coming on for Cook. GOAL! Bungay hit Bishops Stortford on the counter attack the ball played long towards Andrews moving into the box from the right, Parslow comes rushing out towards the attacker, Andrews goes wide then sends her shot in low across the advancing keeper and into the back of the net 0-2. Andrews with another opportunity to attack a forwards pass as Marx and Carver link up the ball up the left Andrews closed down as she reaches the top of the area gets a shot away with the outside of her boot gets the shot on target, Parslow palms it down and gathers in the centre of her goal. Marx tackles to win the ball in the middle stabs it forwards into Leach holds it up well central to goal, turns and squeezes a shot away, Parslow throws herself to her left, the ball runs narrowly wide. Crocker gets forwards from the back for Bishops Stortford plays the ball long into the box left side with Tant making the run hits her on the back, dropping down into the area, Tant goes after it inside, her shot charged down as Nethersell-Webb comes across quickly to block. Natasha Coppin comes on for Bishops Stortford replacing Kenny. The substitute given the ball wide left in attack whips a cross in towards the near post, Stanley can’t bring it down under control before Piper tackles to win possession back for Bungay. Not long after piper indicates she needs to be subbed, Bungay send on Sian Carter. GOAL! Into the last 10 minutes and Bishops Stortford set up a tense finish to this Women’s FA Cup tie as they pull a goal back. Croney with the ball in the middle passes to Stanley ahead of her has the legs to beat Nethersell-Webb racing towards the edge of the area shots sending the ball up and over the keeper into the back of the net 1-2. The goal has lifted Bishops Stortford they press on the left, force Bungay back the visitors pull everyone back to defend their advantage with less than 5 minutes left. GOAL! The visitors relieve the pressure get the ball out into the centre then send it long into the left for Andrews to chase, Haken goes with her tries to marshal the ball out for the goal kick, Andrews gets round her getting her toe on the ball back up the line fires the ball in towards the top of the area, Leach is there picks up the ball strong as she drives into the area, 3 defenders ahead of her blasts a shot in deflects to the left rolling favourably for Andrews coming inside, opens up her body to curl the ball in towards goal looping over the keeper and in 1-3. Not much time left in the game Bishops Stortford press forwards win a corner on the right, played long to Crocker outside the box can’t keep her long range shot down. Andrews after a hat-trick spins and hits a shot central 20 yards out, Crocker blocks it at the back the ball spinning away for the corner. Played in high at the near post Leach rises her glancing header sends the ball on, Johnston gets her head on it behind plays the ball to her goalkeeper. No more time left the referee blows the final whistle and Bungay Town Ladies celebrate the win. An entertaining Women’s FA Cup tie watched by a decent sized crowd of around 150. Saw a fast paced game both sides enjoying the playing surface. An even 1st half Bungay edging it came out the stronger 2nd half stretching Bishops Stortford, Andrews up top moving all across the back line hard to mark a constant outlet for Bungay. The home side pulling it back to 2-1 late on setting up a tense finish before Bungay restored their 2 goal cushion, the magic of the cup. My thanks to everyone at Bishops Stortford Football Club for their help today hopefully the ladies will get to play more games there in the future. Thanks to Graham Purling to for helping me with Bungay’s squad details. Best of luck Bungay Town Ladies in the next round. *additional photo’s courtesy of Ashleigh from Bungay Town Ladies. *Update* The draw for 3rd Round Qualifying has now been made and Bungay Town Ladies will be at home to Acle United Ladies. The game scheduled to be played Sunday 9th October. This entry was posted in Match Reports, SWF Blog, Women's FA Cup and tagged Bishops Stortford Ladies, Bungay Town Ladies, Match Report on September 18, 2016 by WFEast. A new season of women’s football kicked off across the counties in the east with Norfolk, Suffolk and Cambridgeshire all getting their league fixtures under-way. I was excited looking forwards to the new season. Began with a trip across Norfolk to Maltings Meadow the home of Bungay Town Ladies as they started with a tough test against defending champions Aylsham FC Ladies. 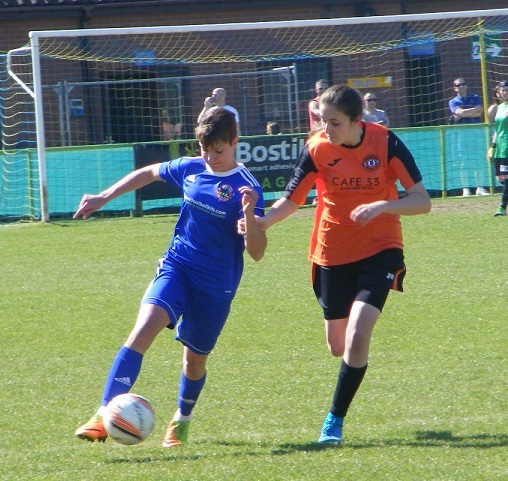 Turned out to be a real thriller, the perfect way to start the season click on the link below to read the action on my Supporting Women’s Football Blog. 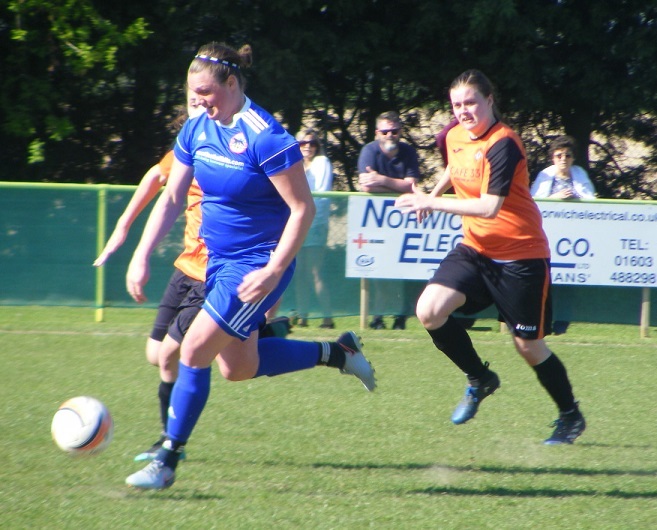 This entry was posted in Match Reports, Norfolk Women's Division One and tagged Aylsham FC Ladies, Bungay Town Ladies, Match Report, Norfolk Women's Division One on September 7, 2015 by WFEast.